During the first two weeks of July, St Mark’s Place will be turned into a foodie’s haven with social outdoor seating, delicious street food from Young’s ‘Burger Shack’, the road will be dressed and lit especially for the event and visitors will be treated to live music on the Thursday and Friday evenings to really get the chilled summer vibes rolling. Head there during your lunch break, whilst out with friends, after work, or for a pit-stop during your climb up the hill to the tennis. An amazing atmosphere and tasty food from the Burger Shack and regular favourites such as the much loved greengrocer selling fresh strawberries will be waiting for you. 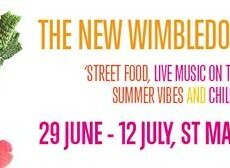 Visit lovewimbledon.org to find out more!